A sarcoma is a cancer that arises from transformed cells of mesenchymal origin. Connective tissue is a broad term that includes bone, cartilage, fat, muscle, vascular, or hematopoietic tissues, and sarcomas can arise in any of these types of tissues. As a result, there are many subtypes of sarcoma, which are classified based on the specific tissue and type of cell from which the tumor originates. It is important to note that sarcomas are primary connective tissue tumors, meaning that they arise in connective tissues. This is in contrast to secondary connective tissue tumors, which occur when a cancer from elsewhere in the body spreads to the connective tissue. The word sarcoma is derived from the Greek σάρξ sarx meaning "flesh". Histological variants of lung cancer classified as sarcomatoid carcinoma include giant cell carcinoma, spindle cell carcinoma, carcinosarcoma, and pulmonary blastoma. Myoepithelial cells are cells usually found in glandular epithelium as a thin layer above the basement membrane but generally beneath the luminal cells. These may be positive for alpha smooth muscle actin and can contract and expel the secretions of exocrine glands. They are found in the sweat glands, mammary glands, lacrimal glands, and salivary glands. Myoepithelial cells in these cases constitute the basal cell layer of an epithelium that harbors the epithelial progenitor. In the case of wound healing, myoepithelial cells reactively proliferate. 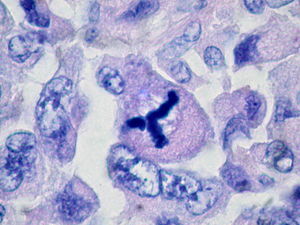 Presence of myoepithelial cells in a hyperplastic tissue proves the benignity of the gland and, when absent, indicates cancer. Only rare cancers like adenoid cystic carcinomas contains myoepithelial cells as one of the malignant component. Acinic cell carcinoma is a malignant tumor representing 2% of all salivary tumors. 90% of the time found in the parotid gland, 10% intraorally on buccal mucosa or palate. The disease presents as a slow growing mass, associated with pain or tenderness in 50% of the cases. Often appears pseudoencapsulated. Sarcomatoid carcinoma of the lung is a term that encompasses five distinct histological subtypes of lung cancer, including (1) pleomorphic carcinoma, (2) spindle cell carcinoma, (3) giant cell carcinoma, (4) carcinosarcoma, or (5) pulmonary blastoma. Mucinous tubular and spindle cell carcinoma (MTSCC) is a rare subtype of renal cell carcinoma (RCC), that is included in the 2004 WHO classification of RCC. MTSCC is a rare neoplasm and is considered as a low-grade entity. It may be a variant of papillary RCC. This tumor occurs throughout life and is more frequent in females. For cancer, invasion is the direct extension and penetration by cancer cells into neighboring tissues. It is generally distinguished from metastasis, which is the spread of cancer cells through the circulatory system or the lymphatic system to more distant locations. Yet, lymphovascular invasion is generally the first step of metastasis. ↑ Tumors and Tumor-like Conditions of the Lung and Pleura. Elsevier. 2010. pp. 51–110. 1 2 Clinical Radiation Oncology. Elsevier. 2016. pp. 649–472. ↑ Odze and Goldblum Surgical Pathology of the GI Tract, Liver, Biliary Tract and Pancreas. Saunders. 2015. pp. 722–736.